Far Valley was established by owner David Kain during the early 1980's. Born and raised in Western Australia, David started full-time farming at the age of 18 and breeding rams at the age of 19. Far Valley is situated in Arthur River, a mixed farming area approximately 200 kilometres south of Perth. During the 1980's and most of the 1990's, Far Valley was a traditional Merino breeder and was registered as a Merino Stud in 1987. Farm Valley was also an extensive pig producer, with 6,000 to 7,000 pigs on hand at all times. When David realised the need to diversify their products by increasing meat production while retaining wool production, he began working with the Dohne breed in 1999. Since that time David has been involved with launching seven Dohne Studs across Australia and in other parts of the world, all of which are still operating successfully today. In 1999, David established the WA Far Valley Dohne Stud. During the same year, David was elected the Inaugural President of the Australian Dohne Breeders Association (ADBA) in WA for 4 years. In 2006, he became a National Councillor of the ABDA and in 2008 was elected the National President of the committee. In 2010, his many achievements and contributions to the industry were recognised as he became an inaugural inductee of the Australian Roll of Honour for the Australian Sheep and Lamb Industry. 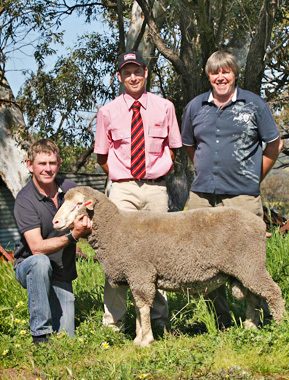 In 2011, Far Valley became the venue of WA's first Commercial Dohne-Ewe Sale. David Kain and Far Valley is well known for breeding animals of the highest rank and use of the most innovative sheep breeding systems available in Australia today.